The Companions by R.A. Salvatore is the first in the six book Sundering series, a realms sweeping event that will once again change the face of Toril. 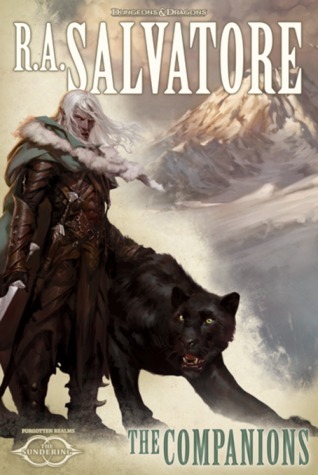 I have been a longtime fan of R.A. Salvatore’s Drizzt series, following each and every adventure since the beginning. Never once have I felt that the story dragged or had outlived itself. Readers of The Last Threshold were left with a cliff hanger. What would happen to Drizzt? Had the series finally reached its end? Had the mighty Drizzt finally reached the end of his adventures? All of these questions ran through my head after finishing The Last Threshold. I want to begin by saying that, in my opinion, The Companions represents Bob’s best work to date. The book is filled with such heart rending emotion from both the characters and Drizzt’s signature introspection (which happen to be my favorite part of the Drizzt series). If you look back at my previous reviews you see that I mention emotion quite a bit. This is an important factor for me. I like books that make me feel what the character feels. If I can cry when a character cries, feel his or her fury in battle, or laugh along with them, then I have experienced a great book. Salvatore gave me this experience with The Companions more so than any other book he has written. What would you do if you could live your life over again? What things would you change? What if you had a goal to work toward? Something that could mean the life or death of a dear friend? All of these questions are asked and answered in The Companions and the journey to the end (or should I say a new beginning) was very entertaining. I received a ARC through Netgalley in return for an honest review. Posted in Book Review, Forgotten Realms, New Releases, Wizards of the Coast. Tagged ForgottenRealms, RA_Salvatore, WizardsoftheCoast.